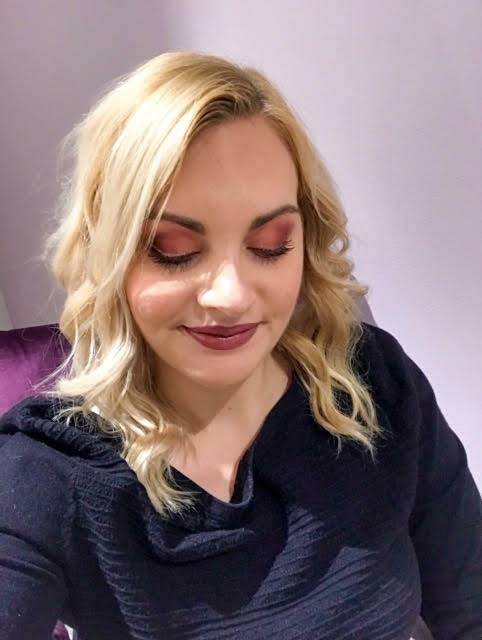 At the end of last year I went along to Debenhams in Brighton for a Pamper Day experience with included a mini facial, full makeup look and a personal shopping session. It was such a fun day and I got so many DM’s after I documented it on my Instagram stories asking more about it that I thought I would do a blog post about it for you where I can talk you through my whole day there! 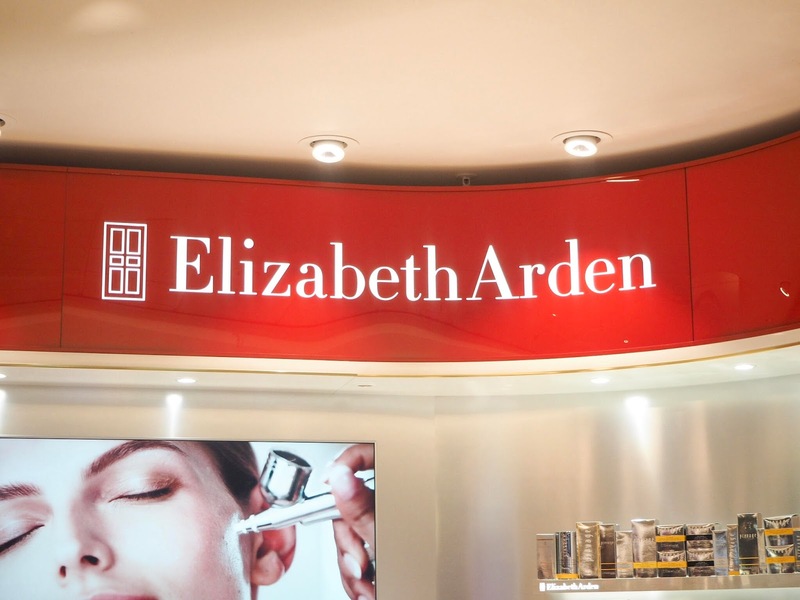 Elizabeth Arden Facial | The day started off at the Elizabeth Arden counter with an express Facial. We were greeted by Diane, who was so friendly and entertaining that by the time we left we both felt like we’d known her for years! I really enjoyed learning more about Elizabeth Arden as a brand and it’s heritage. The main product I’ve tried before from the brand is the iconic 8 hour cream which I love! But I wasn’t familiar with much more. I had the Prevage range used on me and it made my skin feel so soft, hydrated and perfectly prepped for my makeover to follow. My mini facial included this oxygen blast technique! Something I’ve never experienced before but it’s basically just what it sounds like (but a bit more relaxing!). A gadget which blasts oxygen at your face, rejuvenating & hydrating your skin cells. Thank you Diane for making it so much fun, I look forward to coming back for an quick oxygen blast next time I pass the counter. 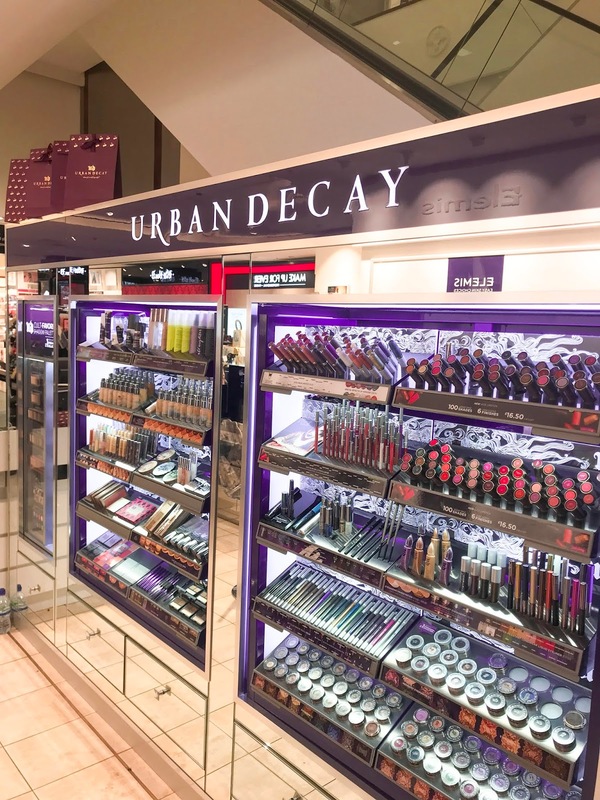 Urban Decay Makeover | Next I had my full make up done by the lovely Alice on the Urban Decay counter! 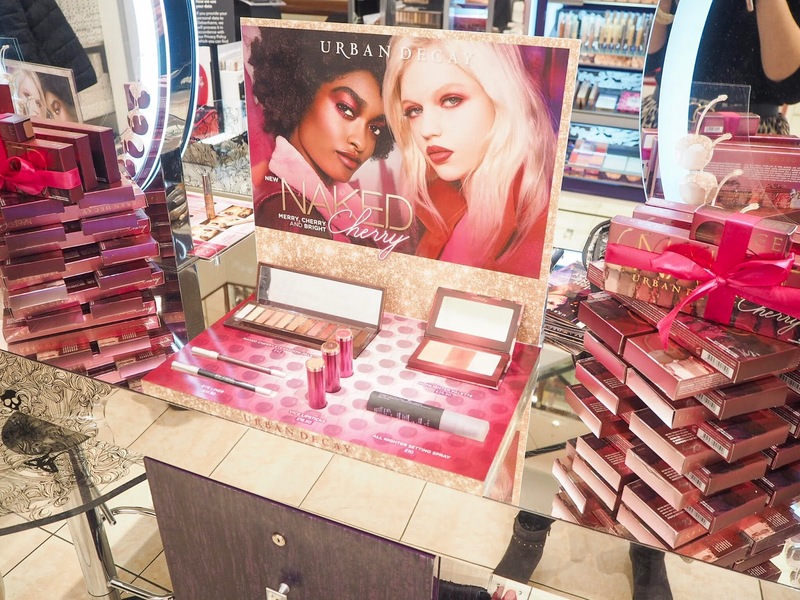 I love Urban Decay as a brand it’s always full of fun and colour with lots of cute packaging. Like most other beauty lovers I know I’ve been using their Naked Eye Shadow palettes for many years and swear by their All Nighter Setting Spray! Of course I chose to have the new Cherry Collection used on me including Cherry Shadow Palette, cheek palette, lipstick. I’d just got the Cherry palette myself so it was fun seeing how Alice put the colours together. I made note of all her tips and tricks for when I used mine at home! We went for the dark of the 3 lip shades for a vampy winter look. Then a little bit of gold glittery eye liner which looked so cool and really made my eyes pop! The makeover was so much fun, big thanks to Alice. 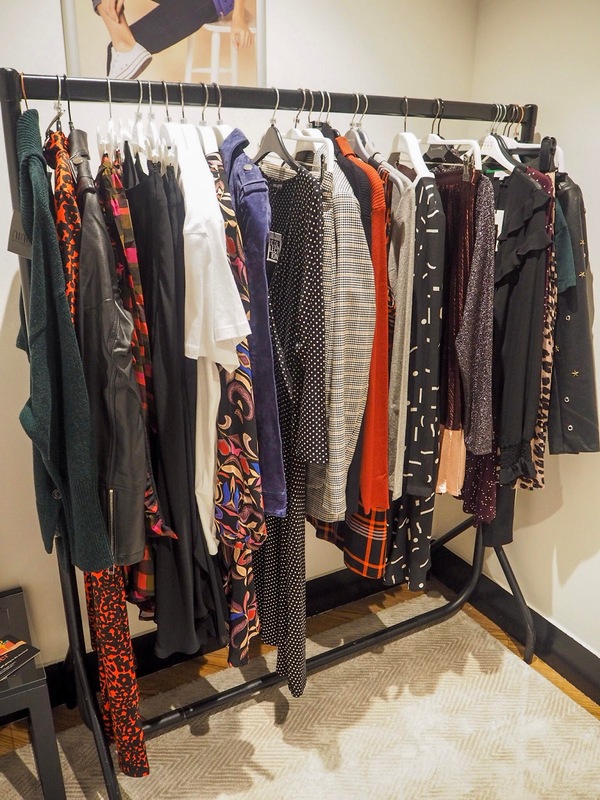 Personal Shopping | Then it was time for my first ever personal shopping experience and I was so excited to see what it was like! 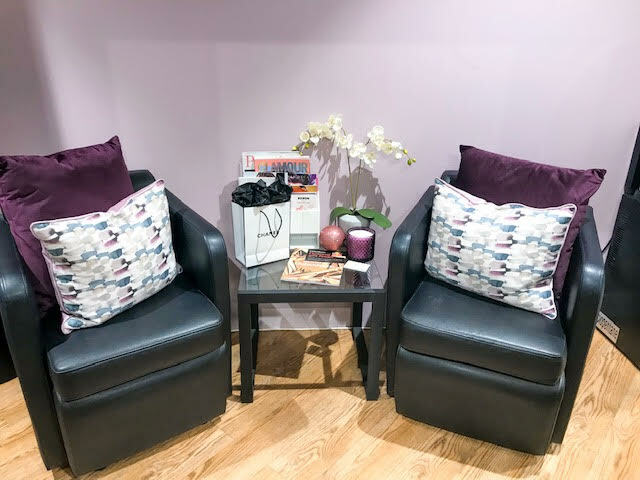 We were greeted by Leanne in the personal shopping suite which felt really luxurious with two comfy arm chairs, a large changing room with mirrors on 2 sides opposite Leanne’s desk area with a lovely display of a few of the latest key clothing items and accessories. Leanne was so friendly and made it all so much fun! She explained what personal shopping was all about and really listened to what my kind of style was and what I wanted. Mum and I were brought tea and cake whilst we chatted and looked though some the options Leanne brought in on the rails. Two of the biggest questions I got asked on Instagram when I posted about it were: a) Is the Personal Shopping a free service? And b) Are you obligated to buy some of the pieces that are picked out for you? The answers to those are - Yes, it is a completely free service open to anyone and no, you are not obligated to or feel under pressure to buy anything afterwards. Although in my case it was too much to resist! You don’t even have to try everything on that is brought into you if you don’t want. I’d recommend taking along a friend or your mum if you feel a bit nervous. Plus it’s really fun having someone else there to show your outfits off too & get a second opinion I think. My mum really enjoyed herself! The service is available to both men and women and they can help with other things in the store, it’s not just exclusive to fashion, so if you’re looking for something in homeware, gifting or beauty then you can book in for that also! 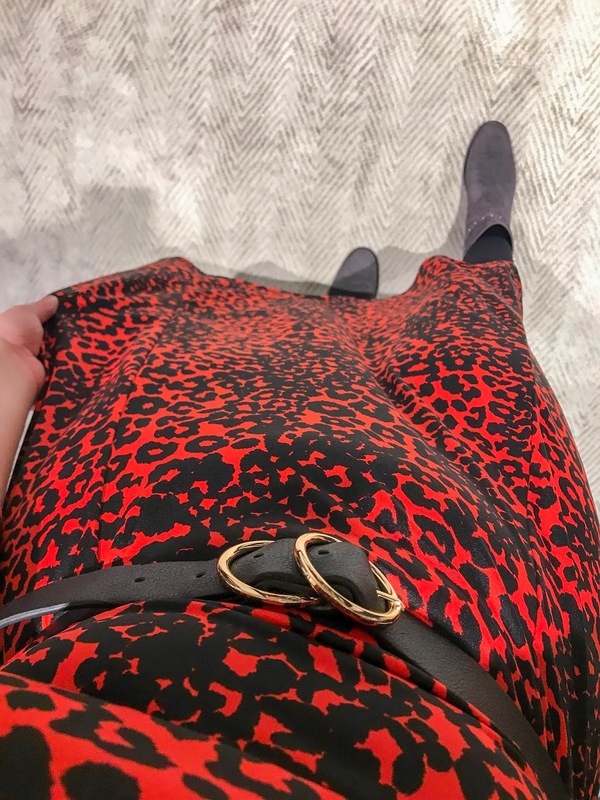 One of the major benefits of personal shopping is that the personal shopper knows the store, and more importantly what’s in stock, like the back of their hand so it’s so much easier that wandering around yourself looking for something. Leanne’s heels clip clopping to and fro the personal shopping suite with more and more fabulous pieces for me to look at became really exciting! I think the perception of Debenhams is that it’s more of a place your mum or gran shops and it’s not somewhere you’ll find young people and the latest trends but that’s far from the case! 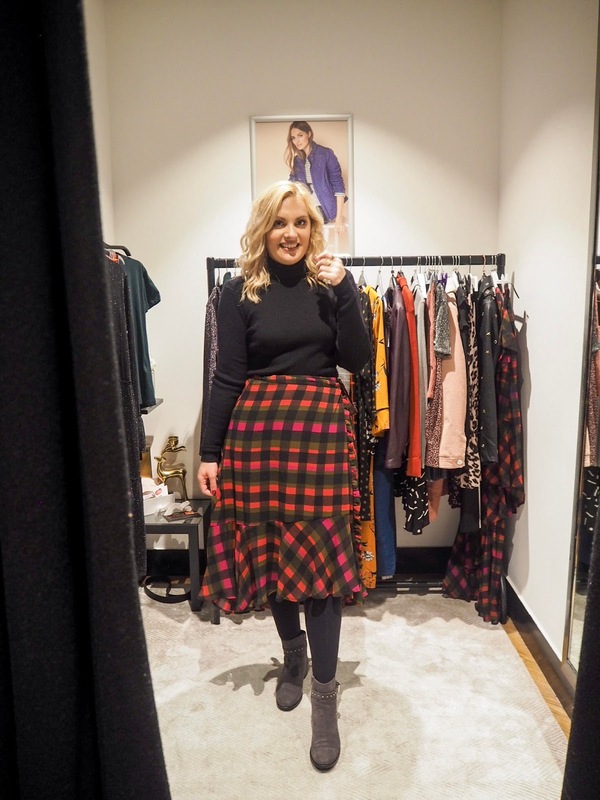 They stock so many different brands such as Warehouse, Oasis and Miss Selfridge plus their in house brands like Red Herring, Jasper Conrad & Studio by Preen (which is where the colourful, check wrap skirt I’m wearing is from!). I think it’s such a great thing to try even if you have no specific occasion you're shopping for, just check out the new season pieces. However if you do have an occasion like a wedding, party or a holiday coming up then it’s perfect! Whether or not you end up buying anything you will definitely come away with some new ideas on how to put your outfits together. 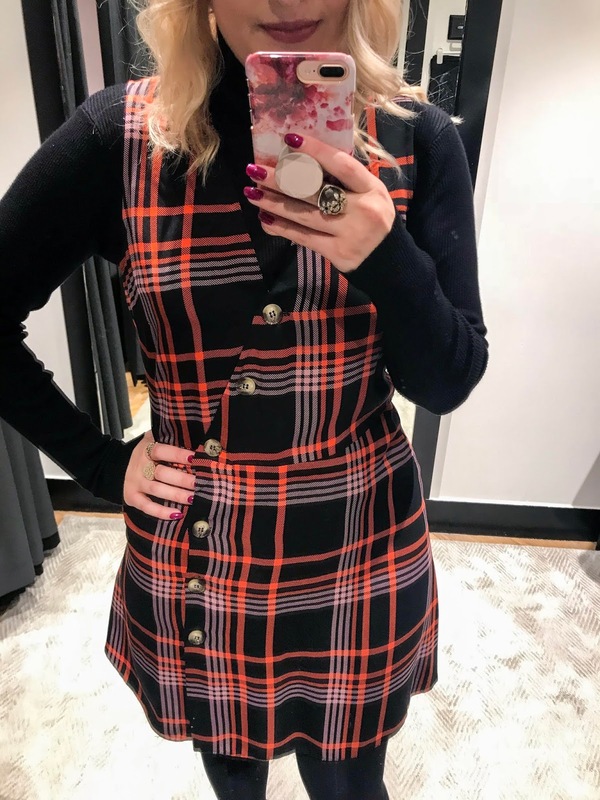 Also if you have something in your wardrobe, like a skirt for example, that you’re looking to find the perfect top or jacket to pair with them I’d definitely recommend bringing it wearing that along and then Leanne (or whoever your personal shopper is) can help you find some great options. I gave Leanne a brief of autumn/winter outfits focusing on midi skirts and skater dresses. 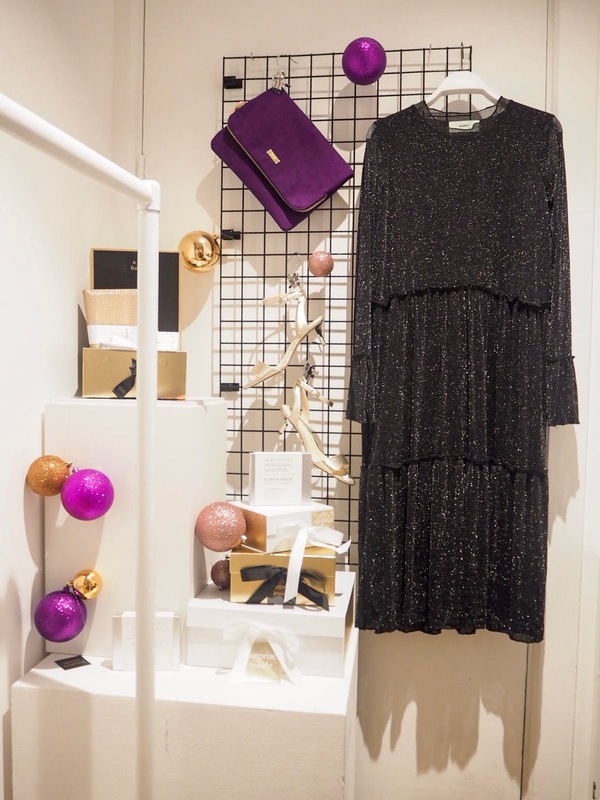 Also it was just before we went to London in December and I wanted a few pieces I could wear up there, something pink for Peggy Porschen’s and something a bit sparkly and festive perhaps! I wasn’t physically capable of trying too many of the outfits on as it’s quite strenuous and tiring on my joints but I had a lot of fun with what I could manage to try! Of course I fell in love with several of the outfits Leanne brought in for me so I couldn’t resist buying a few bits! I went for the flower dress and mauve jacket combo, the silver sparkly dress and belt and the colourful check midi skirt and roll neck outfit. I couldn’t actually afford it all on the day but fortunately they’re able to hold items for you for up to a week which is so helpful. 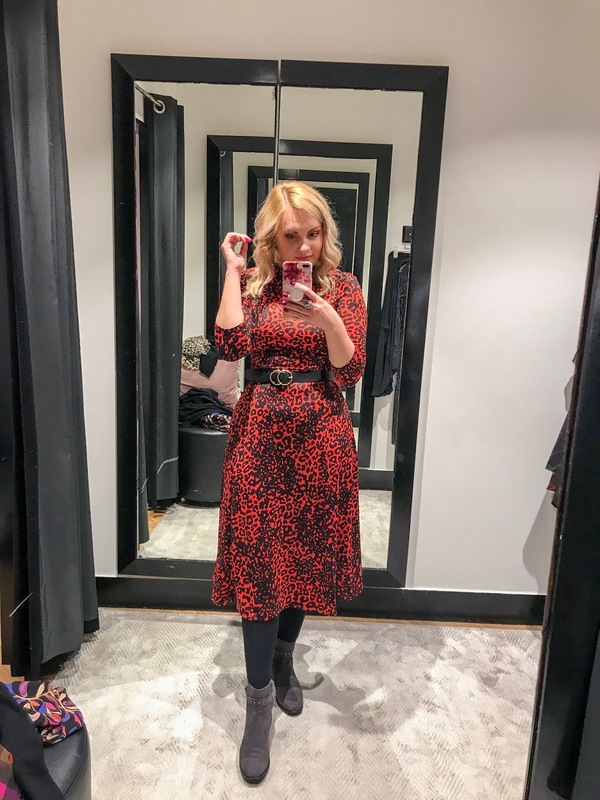 You may well have seen these outfits pop up on my Instagram feed a lot recently as I took some to London and wore the flower dress to Peggy Porschen’s! The pamper day I received was worth around £55. 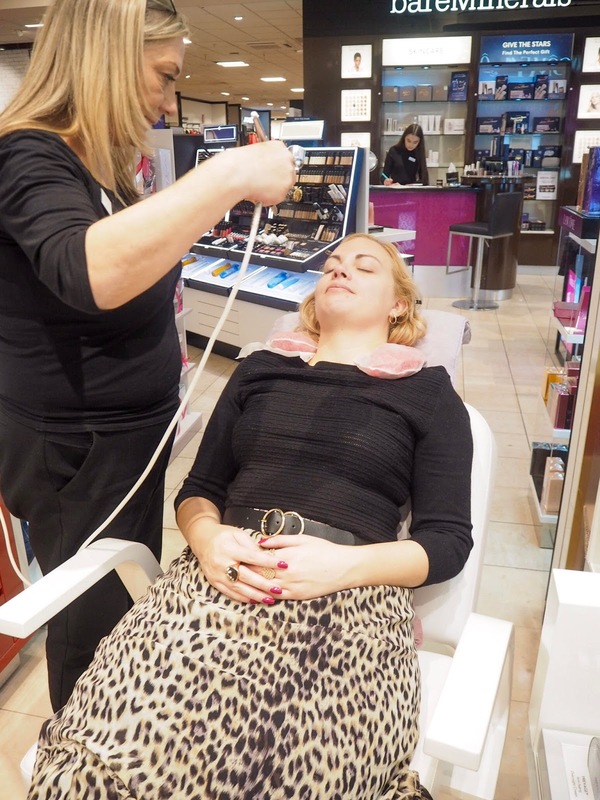 Individually you can get the facial at Elizabeth Arden counter for £15 and a Full Makeover at Urban Decay for £35 plus extra for tea and cake. If you book in for a Personal Shopping session though they can offer you the facial or a mini makeover free of charge! Thank you so much to Leanne, Alice, Diane and to Debenhams in Brighton for making my day so much fun! I can’t wait to go back for another one. *The pamper day at Debenhams was something I was gifted by The Fairytale Fair however all opinions are my own. It sounds like you had a fantastic time. Your outfits all look beautiful and your makeup as well.